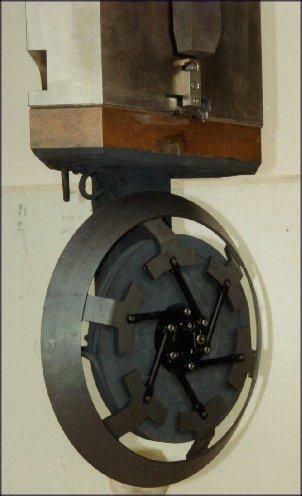 The Megawatt Beam is generated by the 590 MeV High Intensity Ring Cyclotron and after being extracted the Megawatt Beam is guided inside a vacuum system with the help of bending magnets and quadrupole lenses to the Muon production Target station M (5 mm carbon) and E (40 mm carbon) and afterwards absorbed in a beam dump. A Megawatt Beam needs a sophisticated protection system against damage of its vacuum tubes. 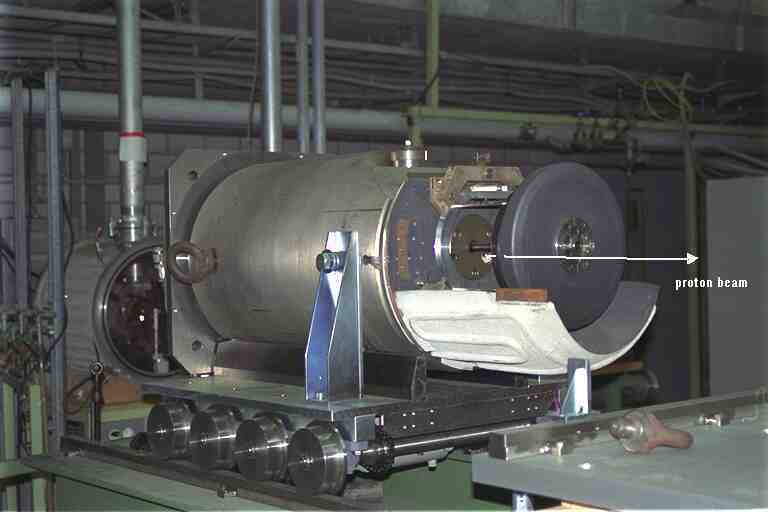 After being extracted (efficiency=99.97%) from the 590 MeV High Intensity Ring Cyclotron the megawatt proton beam is guided inside a vacuum system with the help of bending magnets and quadrupole lenses to the Muon production Target M (5 mm carbon) and Target E (60 mm carbon, since 29-Oct-1999 only 40 mm carbon) and afterwards absorbed in a beam dump or guided to the SINQ target. At the Target station M two Secondary Beam Lines are originating, whereas Target station E has even five of them. The megawatt proton beam lines are shielded towards the Experimental Hall with several meters of concrete and iron. Not near the targets the proton beam losses along the high intensity proton beam line are as low as 1 nA/m (0.6 W/m). Some collimators and scrapers reshape the high intensity proton beam behind target E. Therefore it may also be guided with an additional beam line section to the neutron spallation source (SINQ), where in 2006 the Megapie target will be tested, which is relevant for Accelerator Driven Systems (ADS) being used for Accelerator Transmutation of Waste (ATW). At the moment the proton beam intensity at the production targets M and E is usually around 1.8 mA and above (beam power > 1 MW). For test purposes the beam intensity is occasionally raised up to 2.0 mA (1.2 MW of beam power). SINQ gets only about 1.25 mA (1.0 mA for 60 mm C target) because the beam losses at the Target E region sum up to about 30 % (43 % for 60 mm C target). During the last 2 months of the year 2005 the achieved beam-availability was 95% with proton beam intensities between 1.85 and 1.90 mA on Target E ( 1.2 MW of beam power ) or 1.25 - 1.3 mA on SINQ. In the course of this time period the averaged rate of short beam trips was about 3 per hour. Because of the high beam power of more than a megawatt it is essential, that the proton beam tubes and the vacuum chambers for the different devices (targets, collimators, diagnotic elements and beam dumps) are well protected from being damaged by excessive heat produced by some misguided proton beam, which may happen occasionally by a faulty system behavior. There exists some more info about this Protection System for the High Intensity Megawatt Proton Beam Line Vacuum Chambers. If desired 0.1 to 20 µA may be peeled off from the high intensity megawatt beam at the splitter region (EHT, 13 m after the Ring extraction) and transferred through an additional low intensity beam line to the Pirex target station. Behind this target station a degrader may produce a proton beam of a few hundred MeV and an intensity of about 1 nA either for the Proton Irradiation Facility (PIF) or for medical proton therapy. This section of low intensity beam line could temporarily not be used from 2006 until most of 2008, because the former Pirex target station had to be dismantled. During 2006 medical proton therapy got its own cyclotron (see Proscan project layout). Starting in October 2007 this section of beam line was used again for tests with the pulsed high intensity proton beam for the Ultra Cold Neutron (UCN) source. The shown beam envelopes were computed with the computer code Transport, which is available electronically for various PC operating systems.